Desktop Snow is a very nice Windows application when the end of the year comes. 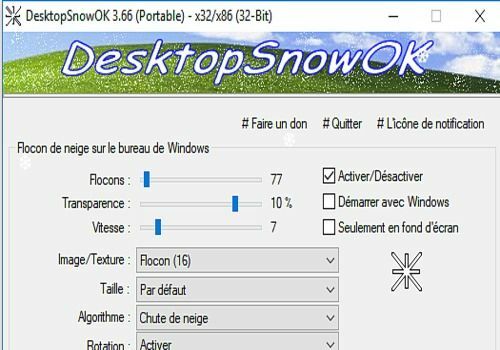 Indeed, it allows you to display snowflakes on your screen, which gives a refreshing effect to your Windows desktop and makes you want to snuggle up on a beast skin in front of the fireplace, a hot chocolate in your hand. The software does not require installation and starts via an.exe. The window that appears will give you a choice of several types of flakes, white or coloured, but also between different speeds, drop modes and other parameters. The effect is quite coarse, but seeing leaves fall on your screen while you are processing a fairly large accounting file can have a soothing effect.